Published: Dec. 18, 2012 at 06:55 p.m. Updated: Dec. 18, 2012 at 07:43 p.m.
Lovie Smith might not survive yet another Chicago Bears hibernation in December. Here's a list you don't want to be on. 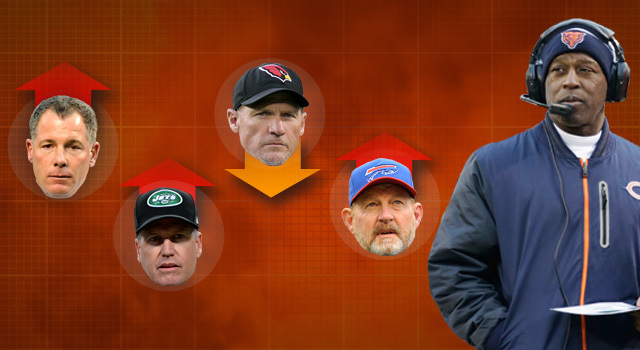 Every week, Around The League breaks down five coaches whose seats are warming up as the weather cools down. Old friends Norv Turner and Andy Reid are almost certainly doomed, so let's show some mercy and take them out of play here. Everyone else is fair game. Here's a fun fact we're sure hasn't escaped the men in the nice offices at Bears headquarters: Chicago is 2-8 in post-Thanksgiving portion of their schedule since last season. Shurmur avoided The Warming Seat for a few weeks as the Browns improved their play. An ugly loss to the RG3-less Redskins surely led to at least one furious Jimmy Haslam III leg-cross. A 50-17 loss to the Seahawks in Toronto proved the Bills can be totally overwhelmed on either side of the border. How can management not act if a Gailey team loses 10+ for a third consecutive season? The Cardinals snapped a nine-game losing streak on Sunday, but Whiz still has his toasty chair. Only two more weeks of Ryan Lindley game film, coach. You can get through this. Poor Rex looked like his head was about to explode as he marched off the field after another Jets meltdown in primetime. Mark Sanchez has finally been dealt with, but could the delay cost Ryan his job?